Airports have some pretty amazing amenities like golf courses and full-service spas. But for cash-strapped travelers, some of the very best airport perks are the ones you can get for the price of showing up. The secret to bagging many of these freebies is being in the know. Here’s a rundown of not-so-obvious airport extras, which are offered to travelers at no charge. Ever since I discovered that water fountains are one of the germiest places in airports, I’ve been inclined to avoid them. The alternative, then, to a water-fountain refill, is usually an absurdly expensive bottle of Fiji. But at San Francisco International Airport, flyers have access to “hydration stations” at each terminal upon exiting security. The difference between these stations and your run-of-the-mill fountain is that the former turn on via automatic hands-free sensors and feature high spigots that facilitate an easy refill. Although not many other airports, as far as I know, have refill stations, it appears to be a growing trend. Chicago O’Hare has them. And last year, the stations were installed at Atlanta’s Hartsfield-Jackson International Airport, too. A tour of Zurich International Airport made our list of 10 Surprisingly Cool Airport Attractions; this behind-the-scenes excursion, while indeed cool, isn’t free. But a bunch of other airports do offer complimentary tours for travelers passing through. There are free Terminals to Tarmac Tours at San Diego International Airport and free tours of Singapore that operate out of Changi Airport, and travelers stopping in Salt Lake City International Airport can hop onboard a courtesy van for no-cost tours of Temple Square. Additionally, Turkish Airlines offers free Istanbul tours for flyers stopping in Istanbul Ataturk Airport, but you must be traveling on that airline to be eligible. The world’s first Skype video booth was installed in Tallinn Airport a few years ago. Travelers can use the station to make free Skype-to-Skype video calls in a private booth with a video screen and a headset. (One can also use the booth to call regular phone numbers, but that feature isn’t free.) So far, we haven’t heard news of the Skype booths having been installed at any other airports. But reportedly, AdTech, the company that developed the initial prototype, plans to set up more booths in other airports in the future. Until then, travelers can use their own smartphones, computers, and tablets to make free Skype-to-Skype calls at airports—or anywhere in the world. Whether seeking ceremony or just a quiet space to sit, flyers will find free facilities for doing just that at numerous airports. 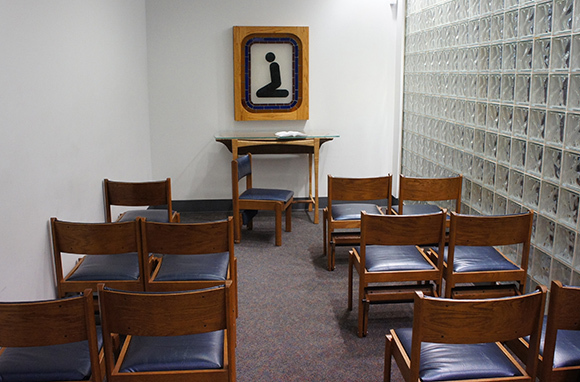 Various religious and spiritual services, from almost-daily Catholic masses at Boston Logan to a quiet, sun-lit meditation room at Albuquerque International Sunport, are available in terminals around the world. Feeling wicked? One can even attend confession at Chicago Midway, where sins are heard 10 minutes before scheduled masses and by appointment. These services are almost always free, but donations are usually welcome. More and more airports are offering animal-relief facilities for those traveling with four-footed friends; this is often a fenced-in patch of outdoor space reserved especially for pets. Some are nicer than others. At Miami International Airport, look for the handful of dog parks surrounded by white picket fences and featuring both grass and dirt surfaces as well as waste-disposal stations. (Note that you’ll have to go through security after visiting Miami’s pet-relief area.) Other airports just have a patch of grass surrounded by chain-link fencing; still, that’s better than nothing. For a more complete list of airport pet-relief areas, see this helpful roundup on Dog Jaunt. Luggage tags might not be the most exciting freebee on this list. But, as many experienced travelers know, they’re available for free at almost all airport ticket counters. And they’re very useful—especially if you’ve forgotten to affix your own luggage tags. You should fill out and attach a bag tag to each checked piece of luggage—and carry-ons too—so that airline staff can identify your bags in case they get lost. You’ll either find the free luggage tags sitting on the check-in counter, or you’ll need to ask for them. Disabled travelers will find special assistance at airports around the world. But they’re not the only ones who need a little help sometimes. Many airports have programs that offer assistance to virtually anyone who needs it, such as young travelers, flyers who don’t speak English, or even lost or confused passengers—for free. For example, at New York’s JFK Airport, a nonprofit program called Traveler’s Aid exists to provide support to kids traveling alone, people who have lost their tickets, or those who have gotten separated from travel companions. Similar setups are available at many airports, from the Meet and Assist program for travelers who don’t speak the local language at Zurich Airport to Customer Care Counters, which can provide information in up to 170 languages, at Vancouver International Airport. Safeguard breakables with a free “fragile” sticker affixed to your bag. Some travelers buy these in advance. But they’re offered at most airline check-in counters free of cost. Just ask your airline customer-service agent to slap a few on your suitcases. Although we can’t promise that the baggage handler tossing luggage onto the plane is going to read and also heed that sticker, it’s worth a try. When your terminal is crowded with hundreds of harried passengers, every outlet is in use, and your phone is running out of juice, try this trick: Ask airline staff to help. This isn’t a guaranteed fix. Airline staff are not obligated to help you recharge batteries if they don’t feel like it. But I’ve talked to travelers who have had luck politely asking a gate agent to charge a phone or a laptop behind the desk or podium (there are often outlets back there). Explain to the agent that all outlets are occupied and that you’re desperate for a charge. Throw in a “please” and a gracious smile for good measure. It all started in Northern California. The Yoga Room at San Francisco International Airport was, according to many reports, the world’s first airport yoga room. Since that amenity opened less than two years ago, it’s become more or less commonplace to see travelers folding into downward dog or working up a sweat via jogging trails in airports. There are free yoga rooms at Dallas/Ft. Worth and Burlington international airports. Baltimore/Washington has a two-kilometer “Cardio Trail” that flyers can access free of charge. Similarly, there are designated exercise paths within Minneapolis-St. Paul and Indianapolis international airports.